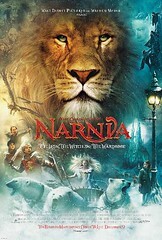 Calvin and I watched Narnia this evening. I really enjoyed it. Since I have been reading the book to my class, I was aware of the little differences with the book narrative. I think that they are minor, and the movie portrays the book's message in an authentic way. My favorite actor/actress is Lucy. The Stone Table scene was powerful and so suggestive of the crucifixion. This afternoon was such nice weather. Esther hauled us down to the beach to drag up some driftwood for some decorations.